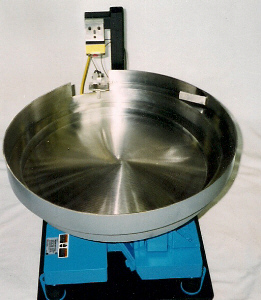 Contact us POSI feeders can orient entire families of parts -- in one vibratory bowl feeder. In addition to a full line of conventional parts feeding equipment and traditional feeder systems, POSI has been producing programmable parts feeding systems since 1984. The programmable units are based on traditional parts feeding technology implemented with programmable tooling modules. For part identification and orientation many of these units include a vision system. The vision system allows only the correct part in the correct orientation to reach the feeder discharge. The vision system can also be used to orient parts that would be difficult if not impossible with conventional bowl tooling. Our visual inspection systems are an extension of our work with programmable feeders and vision systems. These units are designed to ensure that no bad parts are accidentally accepted even if there is a system failure. Our goal is to design and build quality parts feeding and inspection systems that can be easily changed from one part to the next in a few minutes. Our policy is that our systems meet your specifications or you don't buy them. We provide a full one year warranty against defects in materials and workmanship. We are proud of our commitment to ensure that our customers needs are always met. Whatever your feeding and inspection needs, let us tell you what our systems can do for you.